At TED, Juliet Blake helps people tell their stories in a compelling and authentic way. A craft she learnt from her mother and polished over her long career in the media and entertainment world. She is the Head of Television and the Curator of Special Projects at TED. Most recently, Juliet executive produced “TED Talks India Nayi Soch” for STAR PLUS, a major prime-time Hindi-language television series featuring TED Talks from some of India’s most brilliant minds. Hosted by Bollywood star Shah Rukh Khan and broadcast across India to a mass Indian audience, the show’s topics include some of the world’s most pressing issues. This is where I met her as one of the speaker’s on the show. As she briefed us before the show taping about the nuances of speaking on the ‘red dot’, I couldn’t help but plan speaking one on one with her. A few weeks later, I requested her for an interview and she generously agreed. We talked about her life and her life lessons, and I managed to ask her how she is able to find peace in a world that demands her to constantly speak or listen to other people speak. I’m so proud to share her words with you. Deepak: Thank you so much Juliet for taking time to speak with me. Let me begin with what the context of this conversation is. As I was mentioning to you when we first met on the set of TED Talks India Nayi Soch that I collect life lessons. You are someone who is learning so much with the amount of people you are meeting with the work you are doing. Your career stands across different landscapes of different ways to tell stories. You started with Jim Henson Television then the Farscape show, then Nat Geo content to films to TED. I am curious to know how do you define a story? And the importance of the documentation and delivery of a story? Juliet: My feeling is that everybody has a story. Everybody has more than one story and the key to being in my work is to be a good listener, to listen to people. Sometimes, I have worked with TED speakers who have walked on the stage, have had remarkable careers but their story is all jumbled up. So, a part of my job whether it is TV, radio or films, is to have a sort of clarity of mind. My job, what I love to do the most, is enabling other people to tell their stories. Part of that is to be able to listen with a very clear mind and to focus on only one story at a time and one person at a time. Much of my work is listening to people, reading a book or distilling content and actually then thinking about what is the best way for them to use all the words in a book, or a script. Take that and put it in the right order that the story they are telling has a really good beginning, middle and an end. Deepak: So, to condense that, your definition of a story is having all the truths and facts aligned in a right order to evoke something. Juliet: Exactly. And, to speak from the heart and with authenticity. This is something that Chris Anderson writes a lot about in his book, which is, “The more humility you have as an individual, the more gratitude you have for small things in life, I believe, the better storyteller you are.” Not somebody who comes on the stage and makes a very grand speech. A storyteller can be somebody who writes in a small notebook or speaks in a very quiet voice or maybe can’t even express himself in words but maybe can sing or can dance. Storytelling comes in so many different forms and that is what interests me. As someone who has absorbed so many stories, what is the memory you have of hearing a good story? What is the first story you remember listening to? Juliet: My mother was a very good storyteller. My mother had a very sad life in many ways. She lost her parents at a concentration camp. She was a German-Jewish refugee and escaped Nazi Germany. She would talk about her childhood and the things she missed about her parents. I remember feeling very proud about other parents not being like my mother. I thought the responsibility in many ways of carrying on her story telling traditions. Because without the stories of our ancestors, we don’t truly have our history. We can read history in history books but I am interested in remarkable human achievements and that can be ordinary people who do something remarkable by storytelling of keeping a memory alive, of keeping an invention alive or telling something that makes you think about the world from a completely different perspective. Then, I remember very specific lines from individual TED talks that have really moved me deeply. There is one TED speaker. She is an educator working in a very difficult neighbourhood in New York. Her opening line in her TED talk is, “I opened a school, to close a prison.” Just think about that! Sometimes you hear something and you think, that is one sentence that changes how you feel about education and the prison system. This woman’s drive and grit to do something like that! The power of the human voice and the power of words is what humans have and nothing else has. Animals do not have that. That is something we have to cherish. However, those stories have to be told. Whether it is a song, or different ways of storytelling, nobody has the ability to change other people’s minds than by telling stories. Deepak: You mentioned about your mother. I have spent considerable amount of time with people who have been displaced or come from a life that has seen adversity and have stood courageous in the face of it, I want to know if storytelling is a beautiful way to channelize pain and convert it into something meaningful. Juliet: I absolutely think it is. I absolutely think that it is very cathartic when one is in personal pain. You see diaries, you think about the poet Sylvia Plath and people who have suffered from severe depression and have written extraordinary books. I think, storytelling from one person to another or from individual writing that pain and getting rid of that pain through playwriting. My sister-in-law is a playwright and she wrote a very difficult play called ‘Frozen’ which has won many awards. It is not the Disney one. This is a play about forgiveness. This is about a serial killer. The pain that she was going through when she wrote that play was about the death of her mother and the circumstances of her mother’s death but she took that pain and transversed it into a play that took that pain and suffering into a completely different story but she used it to develop something and create a really masterful piece of work. The same can be said for painters. When you look at art, physical paintings, you often see how artists have taken a subject and have turned that subject into something that has great feeling and meaning into it. You have to know that these artists have lived their lives. Some of the best writers don’t start writing until their forties and fifties because they need that life experience, not that children don’t have wonderful things to say. Children do, in the most innocent, honest and profound way. I think as you talk about life lessons, the experience of both good and bad is what creates holistic human beings. Deepak: In some sense, for me the core of storytelling emerges from this philosophy I have which I believe is my life lesson, “When you learn you become a star but when you teach, you become a constellation.” For me, telling and retelling stories allows us to become constellations. Juliet: Sometimes at TED we say that we are nothing but vessels from which storytelling comes about. Some people giving a talk, writing a play or being behind the scenes of the storyteller and helping other people to tell their stories and the storyteller is vessel through which these life lessons flow. Deepak: You mentioned vessels and it is more so the responsibility of a vessel to be unbiased, smooth, flowing and to have space. For me, it is the uncertainty of the people that creates that space. You never know what a 5 year old would say and change your perspective towards something and that is what really makes me passionate about people. What is that about human beings that makes your heart sing? Because one has to love people to be able to curate their stories. Juliet: I like to listen to the interaction between people, both good and bad. I like to hear dialogues between people because when you hear people communicate with each other, whether it is a mother-daughter, father-son, or a whole family, or somebody elderly being looked after by their children. There is so much that we can learn from these human interactions so as a storyteller, I am passionate about people and I love to listen. For me, listening to people’s voices, how they explain things, how they are angry with each other. It is the difference in people’s lives that I am interested in. I am not talking about rich and poor but levels of education and ability to express oneself. Many people have different ways of expressing themselves. People who are introverted, find it very hard to speak, to even put their thoughts in an order. They have all their thoughts inside them whether or not they are able to bring that on a surface. So many times they are great writers. Many times its different ways and different genres of storytelling that I am most interested in. Deepak: I am hearing you answer that question beautifully and I am really taken back to that green room in Yashraj studios in Mumbai, just before the taping began. It was the first episode and you were briefing us. I remember seeing you and being introduced to you with four other speakers and I said to myself, “Wow! That is some job to have.” Most of us envision ourselves or the society envisions us to have very curatorial and conventional job profiles. I am wondering did you, growing up, ever know that at this point this is how your career and your life will end up in this beautiful job role? A profile that probably you would have ended up creating for yourself. Juliet: No, because I did not do well at school and was not academically brilliant and neither was my sister who ended up becoming an Academy Award winning costume designer. I love to draw and to paint but I don’ have the gift that she has. I grew up in a family where there were always lots of interesting people around the dinner table. As a child, I was the only child at most of these dinners. I ended up with many family people and not my family only but family friends, listening to adult conversations. My children grew up the same way. They also like to have wonderful dinner parties with lots of people sitting at the table, listening to people’s stories and saying, that is a family tradition. I never thought that I would be doing what I am doing like producing with Steven Spielberg or be working at TED and helping other people to tell their stories. I think one of the aspects of my working life is that I take on things that are little bit frightening because I find creativity in that. I don’t like to do things that feel safe. I do things that push the envelope a little bit. When I see what you have done, you have a remarkable career. I hear you going to the refugee camps and it is a wonderful thing to be doing. Juliet: I would like to say that every single day a language dies in our world. Deepak: That makes me reflect that people from common corridors of life should also have an opportunity to be remembered by people from generations to come. Your story has so many shades. It has its history rooted in the Auschwitz Camp, it has the shade of producing such a big film with Steven Spielberg and Oprah Winfrey amongst others. How different is this Juliet from the Juliet who debuted in the two-part BBC radio documentary? Juliet: Obviously, I am a lot older. I have much more attention to detail than I had when I was younger. I think with experience comes the knowledge that you really have to put in the work to make it successful. Everything requires team effort. It is not all about me. The series that we just did in India has a wonderful huge team of people from Fremantle to Star Plus and Shah Rukh Khan, who has been such a joy to work with. I think it is understanding, whether it is a small story or a large production, it’s an ecosystem. We are only small parts of something great. It is not about us. It is about group effort, and seeing clearly what needs to happen to make something its very best. Deepak: Do you still feel nervous like most of us? Juliet: For me, it is excitement. For me, nervousness is just the other side of excitement. I really have aspirations for the TED India series that we have just done. I hope that it is not just watched by the middle class. I wish there was a way of sharing it in villages and places that really feel so proud in their brains that they are in India. Deepak: These are the stories that should reach the lower middle class and marginalised people. That is where most dreams die because of lack of resources, lack of opportunity and access to a space where you can say, “I can do this” or “I must do this”. You have actually sparked an idea that through my collaboration with Srishti Bakshi, Founder of Crossbow Miles, we can show it because she is walking on foot from the South of India to the North conducting workshops in both rural as well as city settings. Juliet, you get to see the famous, the great, and master of their crafts on a platform such as TED. Each one of us aspires to be in the company of beautiful, intelligent, famous and masterful people. You get to do that for a living. Once you have spent enough time preparing a person’s talk, helping them have their moment of notoriety, impact and telling a compelling story, is there a lingering feeling of being friends with them or their reciprocation of being your friend. If yes, how many can you accommodate? Juliet: I stay in touch with many of the TED speakers. Not everybody as it will be impossible to do that but I do stay in touch with many people. I think you recognise something in each other and it is not necessarily because I helped them with a TED talk. I might go to them at conference and say that something in their talk really resonated with me. I would ask them out on coffee. Not everybody is my cup of tea either. Sometimes, people will give talks which I don’t love or for me are not ideas worth spreading. Everybody has a story but it is not necessary that the story will resonate with me. I think that those relationships are organic. If it is going to happen, then it is going to happen. We often have speakers staying at our house. We have somebody staying with us at the moment who is a TED speaker, for a couple of days. She is making a speech today at Detroit. I don’t think that work is work. My work, home, joy all marry each other. I don’t have a separation between my work and the rest of my life. 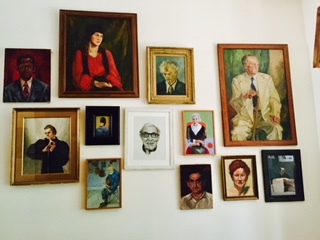 Deepak: No wonder there is wall in your house with portraits of strangers. The moment I read that I took 5 minutes to just soak that in because I thought that is an idea worth spreading. I know you love people. I know you love art. Why is art so important for you or to humanity? 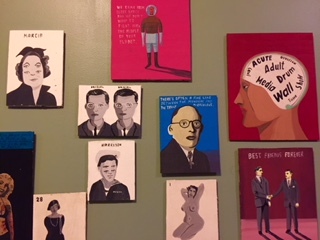 What does this wall mean to you? Why is it a part of your house, your space and your life? Juliet: Because of my love for people. It is as simple as that. I believe, through images, whether they are painted or photographs, you can learn so much by looking at people’s faces. It is great to hear them speak but even if you can’t hear them you can learn so much. I find personally when I am depressed about what is happening politically or I am overwhelmed, my go to place is an art gallery. I would go to some place where I cannot think about me and my life and what is happening with my genres and find peace in looking quietly at pieces of art. Deepak: Is there a story in context of TED or a project that you did that came into your life when you needed healing or support. I believe, our work, when chosen with love, acts as an ointment and cure. Juliet: Yes, there are a couple of them. There is a woman called Rita Pierson and she was the first person I was producing my first TV program with TED. It was about education and the future of education. We had Sir Ken Robinson and it was hosted by the musician John Legend. I was very specifically looking for a person of colour and a woman. I needed somebody who was quite amusing because when you are curating something you need to put in a little bit of everything for a TV program. I was very specifically looking for somebody. I went on YouTube and got to an African-American educator. These standup comedians came up and they were talking about education and their school experiences. Then I found this woman who was preaching in a church. I thought, if she is an educator, religious person, is she not talking to children. Then I researched and found that she was a teacher but on weekends she and her husband have a ministry and run a small church. I tried to find her. It was really difficult. She lived in Texas, Houston. It took me few months to find her. I called lots of organisations. I called that church but she had left that church and that school. She had moved to a different area. When I finally got on the phone with her, she asked me, “What is TED?” I felt that she was perfect and exactly what I was looking for. Because TED has got such an excellent reputation now and with that comes a level of nervousness of the speakers because they think that it is going to change their lives. Well, this woman didn’t care about TED. She certainly changed my life and her talk was about, ‘Every child needs a champion’. She talks about teaching and she also talks about her mother’s teachings. She comes from a line of teachers. For me, it’s the most inspiring talk I have ever been involved with. The extraordinary thing that happened, she came to New York from Texas, gave her TED talk and 6-8 weeks later she unexpectedly passed away. I felt so bad that she had left the world but at the same time she had left this legacy of this remarkable TED talk. It wasn’t a talk where we encourage people to learn their talks and to write a script. She couldn’t do it. That was not who this woman was. Of course, TED can be a little bit rigid, but I knew distinctively that this woman is going to give a mind blowing TED talk and she did. I am very proud to have known her and to have her TED talk out in the world. Deepak: When you are in the business of talking and hearing people talk, how do you find silence? Where do you go for solace, comfort or just some quiet time? How do you bring peace and silence in your life? Juliet: I have a very lovely home and I have very understanding husband who I have been married to for a very long time and happily. He is my barometer and he knows very well when I just need to be quiet. He is marvellous and the perfect counterbalance of the craziness and the tenacious travel and so much noise. Deepak: How old are you? Juliet: I am 60 and very proud of it. Deepak: My last question then would be that in these 60 years of moving, breathing, creating, cheering and brewing magic, what has life taught you? Juliet: My life lesson is ‘Life is not a rehearsal’. Live every single day to the max. Live with passion and live with purpose. When my children were small and we were living in Los Angeles, the mother of a very close friend of our youngest daughter became very sick and eventually died of breast cancer. She left 2 very small children behind. At that time, I was surrounded by quite a few number of people who were dying. I remember thinking that life is so transitory and you really don’t know what’s around the corner for us. It is not just about your health, it is about losing people. So, telling people you love them when you know that you love them. Expressing how you feel, whether it is good or bad. Feedback is a beautiful gift. Enjoying everyday. We taught our children to enjoy the simple things in life. It is not money, houses, gadgets or television, it is growing vegetables, sun, sky, communicating on an individual basis with somebody and making a difference. They don’t have to be grand gestures. They can be the tiniest things that can mean the most. Editor’s note: The interview has been edited for clarity and length. You can watch TED Talks India Nayi Soch on-air and is telecast every Sunday, on Star Plus at 7pm IST. The talks & performances episodically are also made available on Ted.com/India and Hotstar thereon.